Les Rossignols has been tastefully converted to provide a very spacious, light and airy 4 bedroomed holiday home. The living room has a cast iron wood burner and there is electric heating in all rooms. It is located in a quiet rural hamlet and set within 28 acres of private land, consisting of meadows, woodland and streams which you can explore at your leisure. The private swimming pool (saline) and surrounding terrace with grapevine covered pergola, sun loungers, BBQ area and lawned areas overlook unspoilt open views. The pool has an electrically operated security cover, which will support a weight up to 85kgs when closed, it is AFNOR approved, conforming to French statutory requirements. We moved to France in 2005 and after a long search, found this property in a small hamlet between Sarrazac and Jumilhac-le-Grand. A couple of years of planning and easy, problem-free renovation (we've all seen the TV programmes) and in 2008, one end of our 300 year-old barn was transformed into “Les Rossignols d’Ancheyra”. We live in the same hamlet and are available at all times, should you require our help or advice, though of course we realise that if you may prefer to be left to your own devices. Les Rossignols is situated on the edge of the Natural Regional Park of Périgord-Limousin, in the Périgord Vert, the unspoilt northern corner of the Dordogne, known for its landscape of valleys, trees and water. Although it is the quietest of the Périgord areas, we are less than an hour away from the more developed tourist areas of the Dordogne and Limousin. The accommodation is roomy and comfortable, whilst providing access to those people with mobility issues, we have tried to retain the character and charm of the property. The gîte has its own private entrance, pool and landscaped gardens, from which, birdwatchers will enjoy watching and listening to the wealth of birds in this area. It is a beautiful position for people with a passion for painting and drawing, with beautiful scenery without even leaving your terrace. There are many woodland areas in and around the property and this contributes to the very high quality of the air, so stargazers will be pleased with the wonderful sights of the night sky. Ground floor wet room with walk-in/wheel-in shower (manual and self-propelling shower chair available), WC and washbasin, all suitable for people with mobility problems. Ensuite bathroom to bedroom 3 corner bath, shower over, WC and wash basin. Ensuite shower room to bedroom 4 shower WC. Selection of herbs and seasonings, milk, teabags, sugar and coffee. Fitted kitchen with large dual-fuel cooker, dishwasher, fridge/freezer, washing machine, microwave, coffee maker, toaster and a full range of kitchen equipment. Please ask, I have an eclectic mix of 1000+ CDs, all uploaded and downloaded to USB: most genres. Exterior and the ground floor designed to be accessible and wheelchair friendly. Light switches/sockets within easy reach, door widths minimum 90cm, inner hallway width 140cm. Both ground floor bedrooms very spacious allowing for easy access and manoeuvrability. Wheel-in shower and WC with grab bars, specifically designed for wheelchair access. Private car park leads directly onto covered terrace via a sloping ramp with handrails. Lowered/ramped area by the terrace for easy transfer into the pool. The property is spacious, light and airy with most rooms enjoying beautiful open views across the valley. Fully fitted kitchen and spacious lounge/dining area with wood burner, sofas and dining table seating up to 8. One large double bedroom (king size bed) and one large twin bedroom (both wheelchair accessible). The shower room has a walk-in/wheel-in shower. On the first floor are 2 large ensuite bedrooms, one double with ensuite shower room, 1 double with ensuite bathroom with corner bath and shower over. Cot, stair gate and high chair available, please request at time of booking. Electric heaters in all rooms. Outside: The 20 m2 shady covered terrace leads directly off the living room overlooking the pool and grounds. Safety gates at both exits off the terrace. Large table and chairs are provided so that you can enjoy those lazy long lunches or perhaps a glass or two of wine whilst enjoying the beautiful and peaceful countryside views. The private and secluded 10m x 4.5m saline swimming pool (depth 1m – 1.82m) and poolside terrace overlooks open, unspoilt views and offers full sunshine all day long. Enjoy evening barbeques in the peaceful, relaxing and romantic ambiance of the illuminated pool whilst you enjoy the spectacular sunsets.This is a beautiful position for people with a passion for painting and drawing, with beautiful scenery without even leaving your terrace. Outside there is garden furniture, table, chairs, sun loungers, barbecue area and a selection of games for both in the garden and in the pool. There is a large private car parking area for several cars to the rear of the property. Cleaning / Towels / Linen: The property is fully cleaned at each changeover. All linen and towels are provided although we do ask guests to bring their own pool towels. Other: The 20 m2 shady covered terrace leads directly off the living room overlooking the pool and grounds. A large table and chairs are provided so that you can enjoy lazy long lunches whilst enjoying the beautiful views. 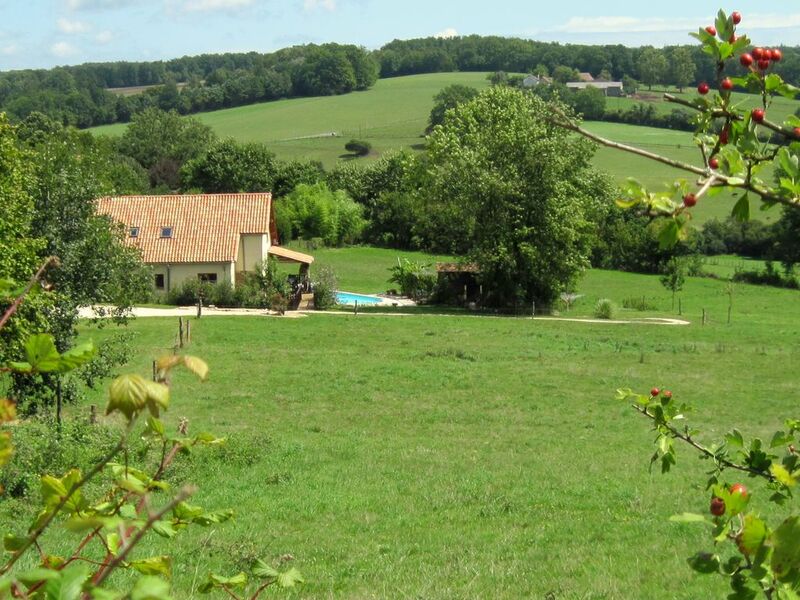 Very comfortable and well furnished gite in rural setting. Wonderfully quiet location. Good sized pool with BBQ to one side. Local village of Jumilhac-le-Grand has a wonderful chateau and some small shops and good restaurant. There is a small market there on Saturdays. Neill the owner lives close by and is very friendly and knowledgeable about places to visit good restaurants etc. Good facilities for ou disabled son. An enjoyable stay in an attractive property with helpful support from the owners. Very clean well appointed house , spacious , with pool, good wheelchair facilities . Warm friendly owners close by. Good touring spot for the Dordogne. We were a mixed-age group, including kids and Gran. First of all we were all struck by the beautiful setting, with views across a lovely valley. We had never seen so many birds and butterflies! There was absolute peace for the oldies and loads of space for the kids to run and play. And of course a lovely clean pool for everyone. When we were tired of lazing by the pool or on the terrace we went off to explore Brantome (a scenic riverside town), Perigueux (good for shopping, with an old quarter) and nearby Jumilhac with its huge chateau, not forgetting the amazing market at Piegut.The gite itself was spacious and very well equipped and owners were nearby if we needed them but never intruded. Highly recommended! "I cannot recommend this holiday "home from home" highly enough! Being a wheelchair user, access is always a big consideration when booking any accommodation. The friendly and informative contact with the owners assured me that the amenities would be suitable. I was not disappointed! The G?te is comfortable, with all the mod cons that worked well for the whole family. Facilities for me were everything that was promised. The private pool (also accessible) was a delight. The location is peaceful with an abundance of wildlife, wonderful to just relax! A car is essential to visit the heart of the Dordogne with everything it has to offer within an hour's drive. If you want peace , tranquility and a wonderful welcome Les Rossignols D'Ancheyra is the ideal destination for you . Set in the beautiful countryside an hours drive from Limoge airport the Gitte is well equipped and tastefully decorated with every convenience you could ask for . The bedrooms are spacious , spotlessly clean and each has it's own bath/shower facility . There is a pool , outdoor seating and barbecue area for you to enjoy . The decked patio just outside the entrance to the Gitte is particularly pleasant for Lunch and pre -dinner drinks . As we did'nt hire a car , the owner Neill had offered to pick us up from the Airport and his wife Terri had organised a delicious meal for our arrival .Both patrons were really helpful and nothing was too much trouble for them both . Extras such as Airport pick ups etc can be organised with Neill or Terri and is of minimal cost . As a family we all felt relaxed knowing that no-one in our party had to drive or cook when we arrived in France so it was well worth it . Both patrons were extremely knowledgeable about the local area and provided tips and suggestions of things to do and places to see . Our family had a wonderful holiday and we are all looking forward to next year when we go back . Thanks to both our hosts ! . Les Rossignols is within easy reach of watersports facilities, beach and swimming lakes (Rouffiac) and rivers (canoeing at Brantome). Limoges airport is a 60 minute drive away with flights from East Midlands, Liverpool, Stansted, Newcastle, Luton, Bourmouth or Southampton. Bergerac airport is a 75 minute drive away with flights from East Midlands, Stansted, Liverpool, Exeter, Birmingham, Leeds, Bristol or Southampton. Calais is a 7 hour drive with frequent ferries and the eurotunnel from Folkestone. Our local village of Sarrazac is a 2 minute drive away (or 20 minute stroll) and offers a post office, bar and restaurant. The larger village of Jumilhac-Le-Grand, only a 10 minute drive away, boasts a magnificent château, several café/bars, bakery, shops and a restaurant. The local area offers swimming lakes with beaches, possibilities for aquatic sport, various historic sights (Richard the Lionheart route) and excellent restaurant and cafes offering regional dishes (truffles from Sorges) in the area. It takes 30 to 45 minutes to drive to Perigueux, Brantome or Limoges. Ancheyra is perfectly situated to explore the heritage of the region, with its medieval villages and cities such as Limoges, Perigueux (Cathedrale St Front) and Sarlat (Cité Medievale), castles (Jumilhac-le-Grand, Puyguilhelm and Hautefort), prehistoric caves (Grottes de Villars and Lascaux), weekly markets and wine markets (Bergerac). In addition there are opportunities for cycling, fishing, horse riding, mountain biking, roller blading, surfing, tennis, walking, water skiing, wind surfing and rock climbing. The property is situated within a 15 minute drive of Lake Rouffiac. Its many facilities include a sandy beach, swimming, water skiing, sailing, tennis, climbing walls and restaurants. Perfect for young children or teenagers. Other attractions include horse racing at Pompadour, the magnificent chateaux at Hautefort and Jumilhac-le-Grand, St.-Jean- de-Côle - which holds the official accolade of being one of the 'Plus Beaux Villages’ in France, and the picturesque town of Brantome known as "Little Venice". Thiviers, our local town is known as the Foie Gras capital and is a 15 minute drive away. The local cuisine includes Limousin beef, foie gras, duck, walnuts and apples. Thiviers has 4 good size supermarkets and railway links to Paris. The Saturday morning market at Thiviers is not to be missed with a huge variety of fresh food, vegetables, flowers, clothes, wine, cheeses and fish and on occasions live music! Booking Notes: Once you have made the decision to spend your holiday at Les Rossignols d'Ancheyra, we will send you conditions of booking and a booking form (by email or post). To secure your holiday a 20% deposit is required. The final balance and payment of the security deposit (£300) being due 6 weeks prior to your arrival (security deposit in most cases, is refunded the week following your departure).Confirmation of your booking will be sent to you by e-mail or by post within 2 weeks of receiving deposit. Changeover Day: Changeover day is Saturday, departures by 10am / arrivals from 5pm although we can be flexible with this where possible but please contact us to discuss arrangements. Notes on prices: Prices are for the property per week in UK Pounds. Maximum capacity is up to 8 persons and baby (twin bedroom can accommodate additional bunk beds for small children). This must be arranged at time of booking. Discounts for smaller parties in low seasons. Discounts available for last minute bookings and long winter lets (over 1 month). Short breaks available in low seasons, please see website or contact us for details.